Hi friends, as I mentioned in my last post I've been MIA because I was overseas in the States for a few weeks. I had an incredible time and am really looking forward to putting together some travel content when I've got a bit of time, but for now I have a lil post about everything beauty related that I picked up on my trip. While I think I was pretty well behaved, I did still pick up a few things here and there. Aside from the fact that my boyfriend and I are trying to be pretty conservative with our money in the lead up to our move to Toronto, it also didn't make sense for me to buy a whole bunch of stuff I would just have to pack up and bring with me. But I couldn't go to the US and not try anything new, so I made a few "necessary" purchases online before we left and got them delivered to our hotel in San Francisco so they would be there when we arrived. That way I didn't have to bring things like cleansers and shampoo & conditioner with me and I got to try a few new things. I was pretty pleased with myself when I came up with that idea. One thing I didn't need but that I just really wanted is the Sephora Favourites Quench Your Skin set. I'm such a fan of mini sets like this because if you're going to use most (or in this case, all) of the products, they usually turn out to be really good value, especially if you're like me and enjoy being able to try lots of different things without having to commit to a full sized product. I could have lived without this, but the one on the Canadian website is different and I liked the US one more, so I had a bit of a #treatyoself moment and picked it up. In my defence, it meant I didn't need to bring moisturiser with me, and because they're all minis I should be able to get through quite a few of them before we leave. 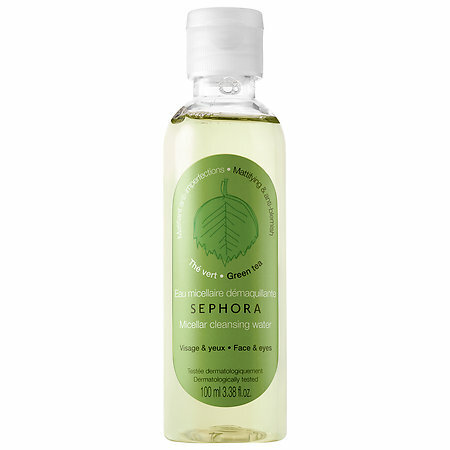 Just before my trip I saw that Sephora had launched a new range of micellar waters with different scents. Because the bottles are a great size for travel (100ml) I ordered one online to use during the trip. I initially bought the Coconut one which turned out to be rubbish. It's more like a cleansing milk than a micellar water and it just smeared eye makeup all over my face instead of removing it, so I took it to a store and exchanged it for the Green Tea version. The Green Tea was definitely an improvement but I don't think it measures up to something like the Garnier Micellar Water, both in terms of performance or value for money, so I wouldn't recommend it and I wouldn't buy it again. One thing I've tried before that deserved a repurchase is the Boscia Makeup Breakup Cool Cleansing Oil. Not only is this a great cleansing oil that removes all traces of makeup with ease, but it comes in a 50ml pump bottle for only $10, and the pump comes with a clip to stop it leaking through your bag. Considering my priority was price over getting a large amount of product, this was probably the best value available at Sephora, and it's an excellent product so I'm glad I picked it up again. As a side note, I noticed it's strangely cheaper to buy three 50ml bottles than it is to buy one full sized 150ml bottle at $32? Not sure what that's about but it's definitely worth getting the mini if you have access to it because it's perfect for travelling. I ordered a mini of the Fresh Soy Face Cleanser because I've heard people talk about it for years and figured now was the time to try it. I guess just from the name I assumed it would be a creamy, opaque cleanser but it's got a thin, jelly-ish consistency that's slightly cloudy. Kind of like the Glossier Milky Jelly Cleanser but not milky, and it smells like fresh cucumbers. Aside from that it's a nice product but it didn't blow me away like I hoped it would. I prefer creamier cleansers for totally superficial reasons, so this one wasn't my favourite. I'll be finishing it up but I won't repurchase it. The last thing I bought specifically to use on my holiday was the Living Proof Restore Trio which I think is great value for $12. You get a 30ml shampoo, conditioner, leave-in conditioner and a sachet of their mask treatment. They're the perfect size for travel, and Living Proof as a brand gets a tonne of hype so I was keen to try out more from them. I'm not really into my hair products enough to tell you that they changed my life, or that they're any better than other shampoos & conditioners, but they do do exactly what they're supposed to and a set like this is a great way to try out a new brand, or just pick up everything you need in travel size. Two things I tried to order online but were out of stock are the Drunk Elephant dayglow & nightbright mini duos. Luckily I spotted them in store and was able to pick them up, because brands like Drunk Elephant don't often release minis at such an affordable price point. I know minis aren't always the best value for money ml for ml, but as I said earlier, I often prefer trying different products over getting more of one product, especially when I'm trying something new and don't know that it's going to work for me. This way I get to try 4 of their products for less than the cost of any one of these full size, plus they're teeny tiny (8ml each) and won't take up too much room in my suitcase, but there's still enough product to get a feel for how they all work, so I'm really happy I got my hands on these. These last two I picked up right at the end of our trip when we had a bit of money left over, so I got a couple of treats for myself. The first one is the Elizabeth & James Nirvana Bourbon rollerball. I know I could have bought this in Canada but it's so small it won't make much difference in my suitcase, and it's a really beautiful scent. This is definitely my favourite of the Elizabeth & James Nirvana range - it's super warm and smokey and very different from the rest of the line. Definitely give this a smell if you get the chance because I think it's beautiful and a rollerball wasn't going to break the bank either. The last thing I picked up was the Anastasia Liquid Lipstick in Sarafine. At one point I went into Sephora on my own and really got to browse everything thoroughly and this jumped out at me more than anything else. So many brands have brought out liquid lipsticks lately and I swatched a whole bunch of them but this is the only one that stuck in my mind. Obviously I don't need any new lip products (does anyone who likes makeup ever need new lip products?) but I think only buying one on the whole trip shows considerable restraint. The brand describes it as a deep blue red, and deep reds are my weakness, so this baby was too beautiful to leave behind. Everything else pictured above was a freebie - some were point perks and the rest came with the online orders I placed before we left. I'm such a fan of the way the Sephora offers samples and minis so freely because for me a lot of the enjoyment I get from beauty products comes from satisfying my curiosity about them. And not only do I love trying new things, but I also love the feeling of satisfaction you get when you finish a product up, and you get both of those feelings more often when you're working with minis. Not to mention that minis tend a lot cheaper than a full sized product, and I hate investing money in something to find that I don't like it as much as I thought I would. Plus when you get the minis for free you really have nothing to lose because if they don't work for me I just pass them on to my friends and family. I haven't tried a lot of these yet, but I have tried the Too Faced Sweet Peach Creamy Peach Oil Lip Gloss. I feel like there are a lot of people online who either love or hate the Sweet Peach line. I'm pretty indifferent but whoever came up with the name for these is a genius. The words "creamy peach oil" make them sound incredible even though intellectually I know that a) peach oil isn't a real thing, b) the ingredients only list "peach extract", c) it's just a lip gloss, and d) I don't wear lip gloss very often. For the record it's a nice enough gloss but I actually hate the smell. It doesn't even smell like peach lollies, it's just super artificial and kind of smells like medicine pretending to be peach flavoured. I haven't smelled the powder products in the line so I'm not sure if the scent is the same, but I find it pretty off-putting and I'm glad I got to trade some points to try one for free.